You don’t need a $400 pan for the perfect roast. A large roasting pan is an investment piece that makes cooking for holidays and large gatherings a little more special, but if you’re tight on kitchen space, what do you do with it the rest of the year? Those equipment behemoths meant to roast a turkey are not something you can easily stash away in a small kitchen. Instead, consider one of these useful items that can tackle any of your roasting duties, plus a handful of other cooking tasks. From a durable skillet that costs less than $30 to a compact braiser that looks great on your stove-top, we’re all for multipurpose kitchen equipment. These versatile kitchen items that can also be used for baking, broiling, and roasting your favorite meats and side dishes. Every kitchen should have at least one well-seasoned cast iron skillet. Not only are they our go-to for searing steaks or cooking frittatas, but this oven-proof skillet is fantastic for roasting. It has the same thick walls and low sides as a roasting pan (and at a fraction of the cost). The thick cast iron conducts heat evenly and the low walls allow air to circulate, creating even browning. Start a thick piece of meat on the stove top, then pop the whole skillet right in the oven to finish cooking. Plus, a large 12-inch pan, like this one from Lodge, has enough surface area for a sizeable piece of meat. Try it out with this impressive pork loin stuffed with apples and pumpkin seeds. 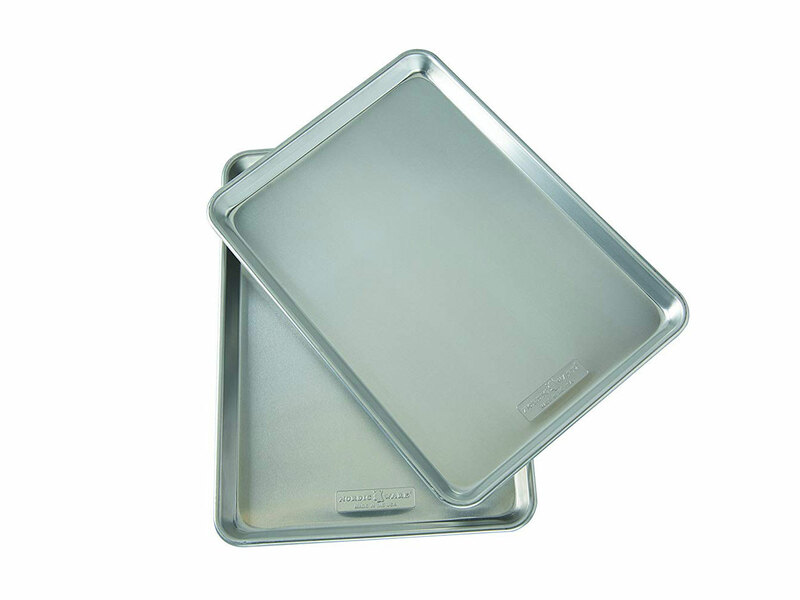 A rimmed baking sheet is thin, lightweight and so much easier to store than a roasting pan. It’s also a kitchen essential that we reach for every day. 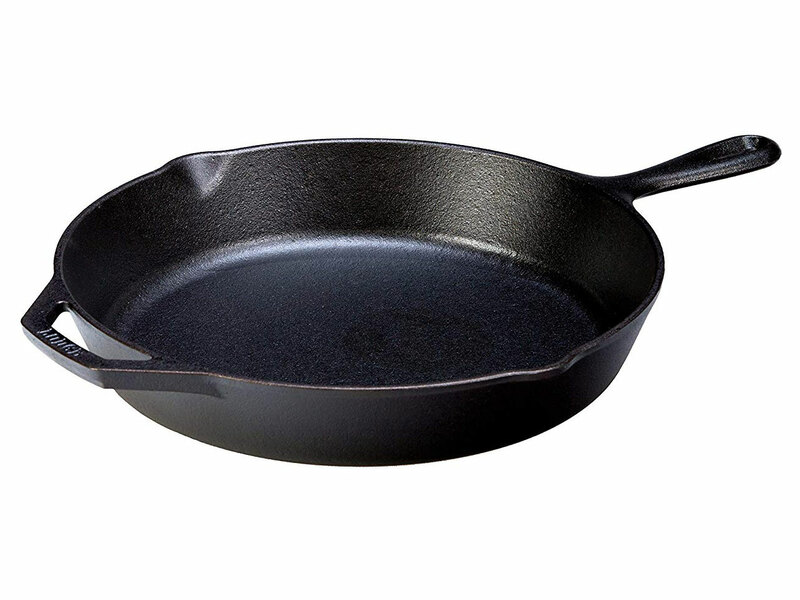 If you’re spatchcocking a turkey or roasting a whole fish, this should be your pan of choice. While you can roast meat right on the metal surface, we like to set a wire cooling rack (in place of a roasting rack) inside the baking sheet for recipes like this spatchcocked turkey with pink peppercorns and thyme to help air circulate around the meat. 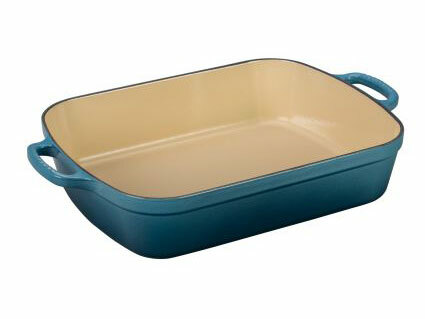 A baking dish has a low-profile design that is ideal for roasting. Plus, the handles make it easy to hoist in and out of the oven. We love this oversized baking dish from Le Creuset because you can use it to make lasagna for a crowd or as an impromptu roaster for a Thanksgiving turkey. Because it’s made of cast iron, it can also go straight on your stove top when you want to turn those drippings into gravy. Did we mention that the enameled surface also makes clean-up a breeze? Put this pan to the test with this Slow-Cooked Sweet-and-Sour Pork with Pineapple. Shred the meat right in the baking dish and bring straight to the table. For obvious reasons, everyone turns to a braiser for recipes that require more moisture like braised chicken thighs or stewed greens, but take off that lid and these heavy-duty pans are great for roasting. 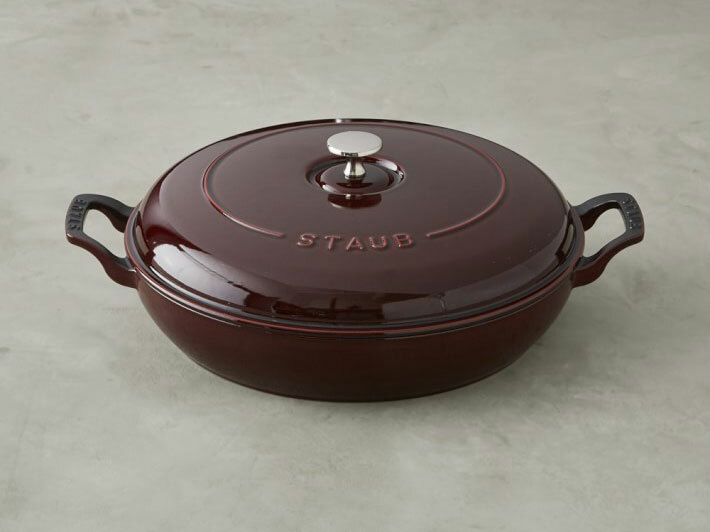 This chic braiser from Staub is made of enameled cast iron, which transfers and retains heat evenly throughout the bottom of the pan. It also has wide upturned handles, which make lifting it from the stove, to the oven to the table very easy. Try it out with this beef chuck roast rubbed with paprika and herbs, then carve the meat and use this pan as a serving dish. A Bundt pan might be the most unusual choice for roasting instead of a pan with a rack, but it gives you a phenomenal roast chicken. Similar to beer can chicken, the cavity of the bird slips around the center column creating 360° of crispy skin. Fill the bowl of the Bundt with vegetables, aromatics, potatoes or bread cubes to soak up all of the delicious chicken drippings (and place a sheet pan under the Bundt to catch any rogue juices). F&W Mad Genius Justin Chapple shows us how it’s done and gives you a recipe to try out for Bundt pan chicken. 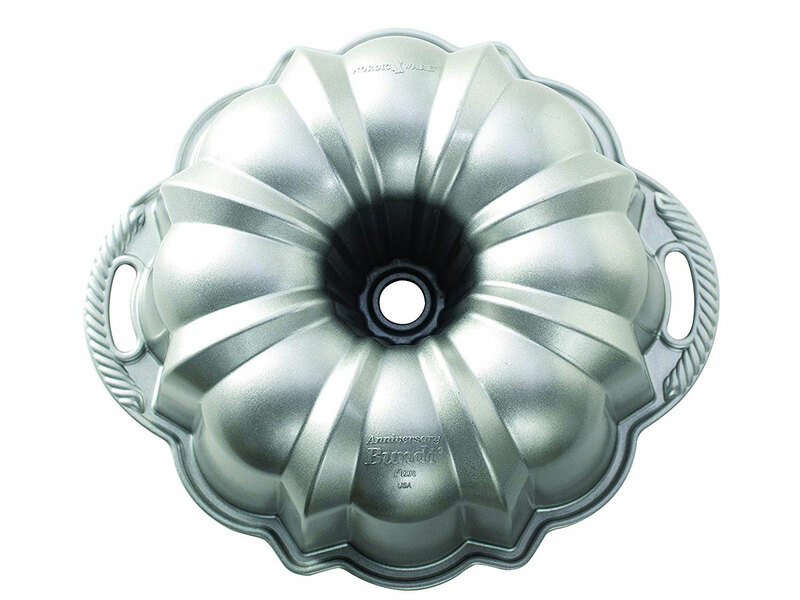 We like this durable Nordic Ware Bundt because it has wide handles, making it easy for you to take your chicken in and out of the oven.